In the early 1900’s archaeologists surveyed a small cave known as the Fairy Hole. In it they found pottery pieces, flint, and arrow heads; evidence that the cave was once used by the Lenape Indians. The Lenape were the native people who lived in Northwest New Jersey. 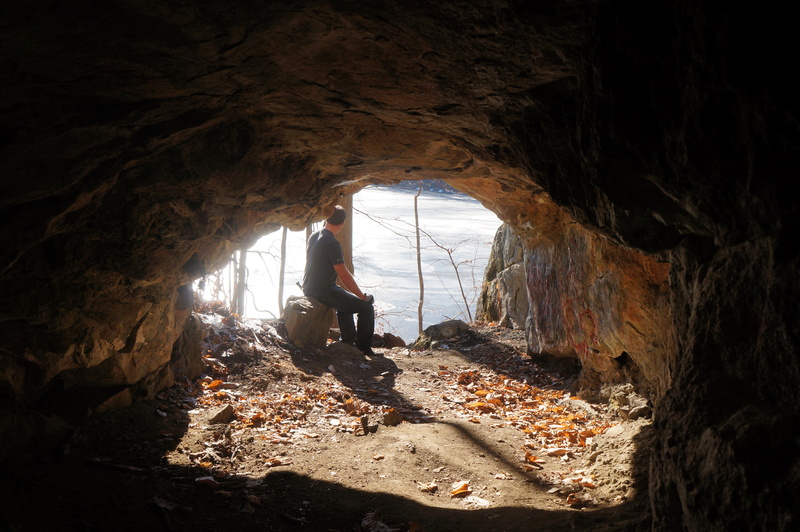 The cave is thought to have been used as a resting spot for the Lenape as they traveled or hunted. It is also in close proximity to several burial sites, so it could also have been a religiously important site. I have wanted to visit it for a while, given my slight obsession of all things cave. So one bright winter day we headed out to explore the Fairy Hole. We parked near Ghost Lake and began to follow a faint trail around the lake. 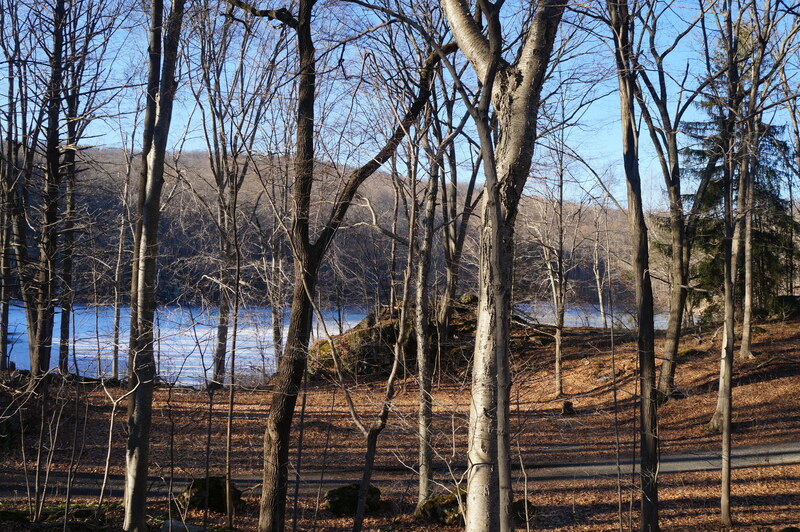 The lake was not there during the time of the Lenape, but was created much later by two men who dammed a creek to create a lake between their homes. The trail hugged the lake and wound its way up and over rocks and downed trees. It was overgrown in many spots by trees and pricker bushes. The sun shone brightly in a crystal clear blue sky. We stopped for a bit and I sat on a rock with my head tipped up to the sun; its warmth providing such an amazing feeling in the middle of winter. The lake, frozen by winter’s cold, had thawed some. The kids had fun throwing rocks into it attempting to break the ice. Finally a rock big enough to break the ice was found and we could move on. 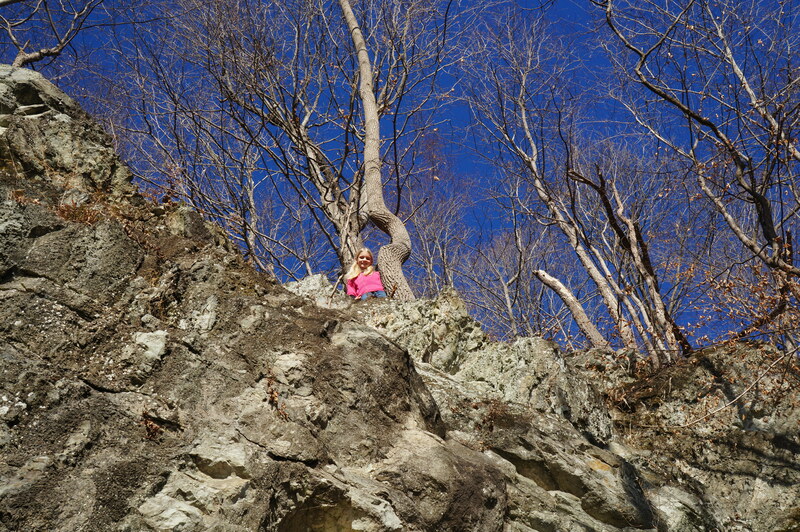 We rounded a corner, looked up, and there it was about 20 feet above us; the Fairy Hole. 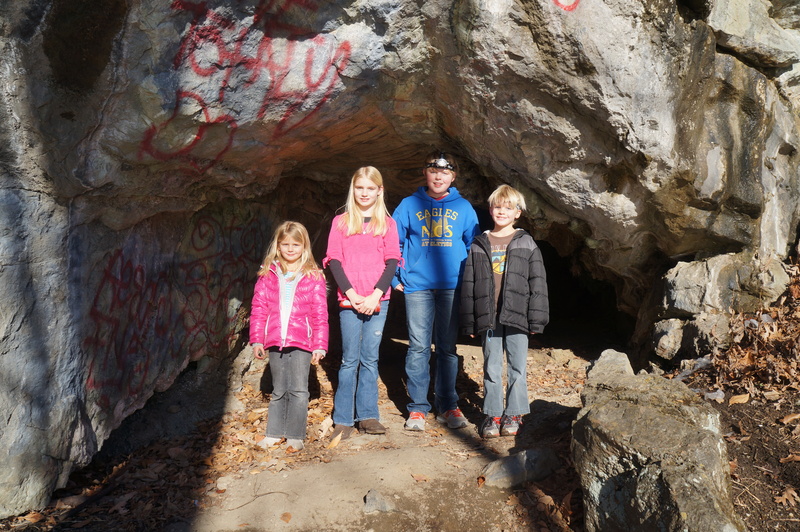 It was an easy scramble up the hill to reach the entrance of the cave. 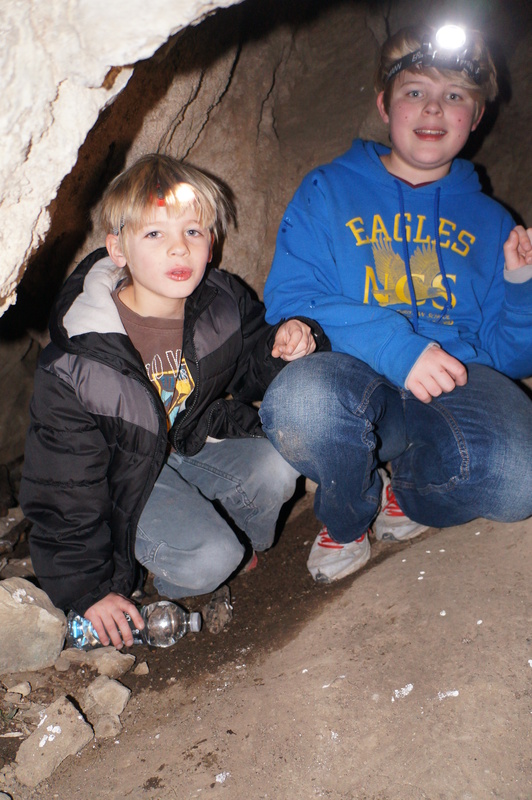 The kids quickly entered the cave and began to explore. The opening was wide and tall, big enough for them to stand upright in it. The ceiling became lower towards the back of the cave. I broke out our headlamps so they could explore a little further. At the back of the cave was another opening to the right. My son shone his light in it and realized that it was a natural chimney. The opening went straight up. He and my daughter were exploring the opening when I heard a scream. Cave crickets! The chimney was full of them. They backed out of the opening and spent the rest of the time in the main part of the cave, imagining what it would be like to actually need to use the cave. 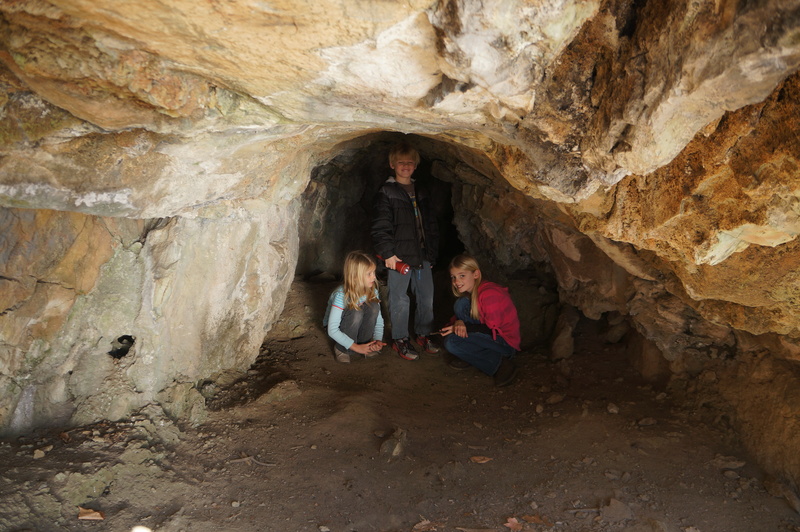 Then it was out to explore the outside of the cave. 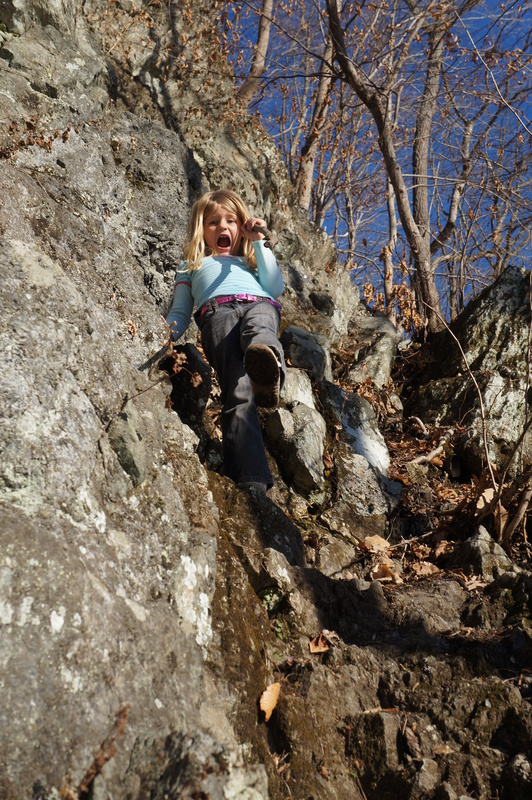 The opening was in the side of a huge rock hill just begging to be climbed. They quickly scaled the rocks and were soon standing on top of the hill, high above the cave’s opening. All too soon it was time to go. Shadows were closing in quickly on this short winter day. The warmth of the winter sun had given way to a chill. We headed back out and around the lake. On the other side of the lake I stood and looked back at the cave. From this viewpoint it was all but impossible to make out. Rocks and trees and shadows hid the entrance. The cave stood, as it has for centuries, waiting for another group of travelers to discover and explore it. Another wonderful blog` left me shivering and shaking!! Beautiful description. Kids are blessed to explore all of this! Your children will never for get that wonderful place, I lived there in the 1960’s, we had many wonderful adventures exploring the mountains surrounding the cave. Ice skating most of the winter. The geology is so diverse, rumored to have and silver and copper mine on the top on the mountain. Found mine pits filled with water. I venture back in the spring and fall, the bugs are just to bad in the summer, misquotes and ticks. Too bad the house and cabin on the top of the mountain were tore down, great view from up there.